It's time once again for the "Great Minnesota Get Together." Weather plays quite a role in the State Fair experience. Who doesn't remember braving the heat with the crowds on one of the busier intersections on a sweltering afternoon? A quick rain burst will send people scurrying for cover, and folks savor balmy days in the 70s with just a bit of a breeze. Below are some State Fair weather facts and notable weather events that have happened in past Minnesota State Fairs. There can be some spells of hot weather during the Minnesota State Fair. The hottest day in the history of the Minnesota State Fair was on September 10, 1931 with 104 degrees. The hottest average high temperature for the duration of any State Fair back to 1885 is also 1931 with 92.6 degrees. 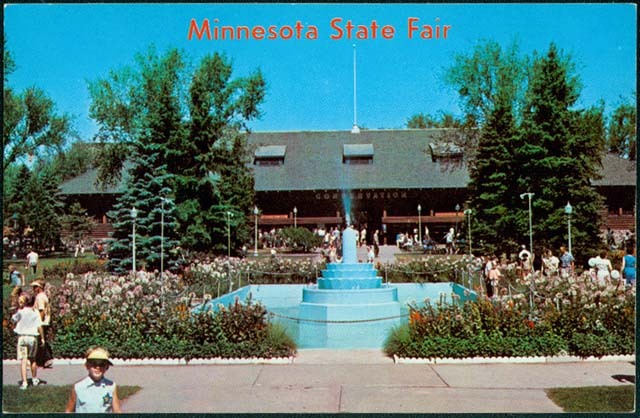 Note that the Minnesota State Fair in 1931 ran eight days from September 5-12. The 2013 Fair was the third warmest on record with 88.2 degrees and also had the most 90-degree high temperatures on record with six days. 2012 had the sixth warmest average maximum temperature with 87.1 degrees. The coolest Minnesota State Fair was during the six-day run of the Fair from September 5-10 1898 with an average maximum temperature of 64.2 degrees. The coldest maximum temperature for the Fair is 52 degrees on September 7, 1911, and the coldest minimum temperature is 33 degrees on September 13, 1890. The coolest Fair morning in recent years was a chilly 36 degrees on September 1, 1974. The last four State Fairs have seen an absence of hot weather. There wasn’t a 90 degree high temperature during the State Fair from 2014-2017. The last 90+ degree temperature was August 29, 2013. The 2018 Minnesota State Fair runs August 23-September 3. On average it rains about three to four days during the Fair's 12-day run. The wettest Fair was in 1977 with 9.48 inches, and the driest Fair was 2003 with only .02 inch of rain. The largest rain event in the State Fair's history was August 30, 1977. At 8:20pm heavy rains hit the State Fairgrounds. The U of M St. Paul Campus climate observatory one mile north of the Fairgrounds reported 4.06 inches of rain. This caused some of the worst street flooding seen at the Fairgrounds. The bulk of the rain fell in a 3 1/2 hour period from 8:15pm to 11:45pm. The grandstand show was cancelled, and people had great difficulty trying to leave the Fair. The Twin Cities International Airport saw 7.28 inches from this event, second all-time only to the July 1987 "Superstorm" total of 10.00 inches. People driving on I-94 leaving the Fair found water "up to their hood ornaments" in low areas under bridges. The peak of severe weather in the Twin Cities happens in June, but severe storms can and have happened during the State Fair. As recently as 2007, just two weeks before the Fair was to start, a thunderstorm with high winds estimated to 67 mph hit the fairgrounds. Below is an excerpt from Storm Data on August 11, 2007. On August 31, 1989, Golf ball-sized hail fell at the Fair in the afternoon, baseball-sized hail was reported at Fairmont, St. Michael and Hutchinson. On August 17, 1940, a severe windstorm hit the Fairgrounds one week before it opened and blew down tents and damaged equipment on Machinery Hill. One of the tents downed was a block long "big top" tent that housed the International Harvester Co. farm implements. Persons on the hill escaped injury. See Weather Records from past Minnesota State Fair Years.